Cardinals are the first birds to come every morning for breakfast and a drink from the heated birdbath. Usually they show up as soon as there's just a little bit of light, long before the sun rises. I find the female particularly lovely, with the subtle warm tones of her breast. Of course, if all you could see was that big, bright bill, you'd know instantly that you were looking at a cardinal. 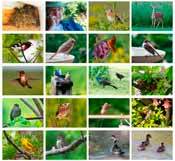 Everyone interested in wild birds deserves her or his own binoculars. Like the Vortex Fury 8x32. It's one of our favorites. It rated high on our review of Mid-sized binoculars (see November, 2010, issue of Bird Watcher's Digest), even though at $269 it was one of the least expensive binoculars in the study. Now it's on closeout. While supplies last, you can get it for $169.99. 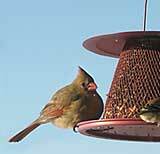 It's called the No-No Cardinal Feeder. It says NO to squirrels, who can't reach through the all-metal feeder. But it says YES to cardinals. It's easy for cardinals to use. 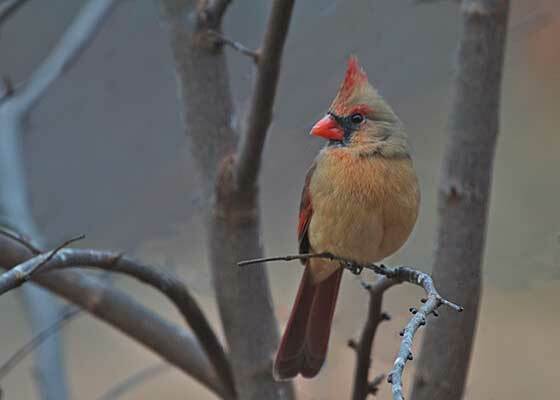 Cardinals don't like to feed with their necks turned sideways. They like to land and eat straight ahead.